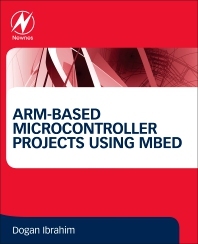 ARM-based Microcontroller Projects Using mbed gives readers a good understanding of the basic architecture and programming of ARM-based microcontrollers using ARM’s mbed software. The book presents the technology through a project-based approach with clearly structured sections that enable readers to use or modify them for their application. Sections include: Project title, Description of the project, Aim of the project, Block diagram of the project, Circuit diagram of the project, Construction of the project, Program listing, and a Suggestions for expansion. This book will be a valuable resource for professional engineers, students and researchers in computer engineering, computer science, automatic control engineering and mechatronics. Dogan Ibrahim graduated from the University of Salford with First Class Honours in Electronic Engineering. He then completed an MSc course in Automatic Control Engineering at the University of Manchester, and PhD in Digital Signal Processing at the City University in London. Prof Ibrahim worked at several companies and gained industrial experience before returning to the academic life. Prof Ibrahim is currently a Fellow of the IET, and a Chartered Electrical Engineer. His interests are in the fields of microcontroller based automatic control, digital signal processing, and computer aided design. Dogan Ibrahim has been a lecturer at South Bank University, London, and Principal Research Engineer at GEC Hirst Research Centre. Prof Ibrahim is the author of over 70 technical books in the fields of microcontrollers and electronic engineering. He is currently a systems consultant, carrying out consultancy work to various firms in London.